Aidan is a Hollywood actor forced into retirement after everyone he loved betrayed him. Donnie, his brother envied him so much that he managed to turn everyone who ever loved Aidan against him. Still he wasn’t satisfied he wants him dead and invoked the god Dolor, the God of Pain, to do the dirty deed for him. Leto is one of the sleep gods is Dolor’s arch enemy. She was in deep slumber until she felt Dolor stir and knew she had to do anything and everything in her power to stop him. She had to use Aidan’s anger to feed her energy so she can defeat Dolor and send him back to his own hell. The premise for this book is an upgrade from Dream-Hunters. Although I must say there is still a lot of things to be want. 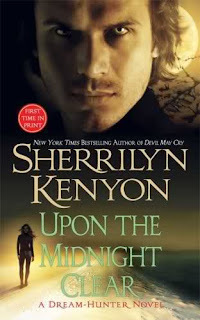 It seems like Kenyon is not as inspired to write this series the same way she wrote Dark-Hunters. After all, it’s a bit of a challenge to write about a race that cannot feel anything and suddenly awaken their emotions and feed them with too much passion. Even the characters though fictional will be shell shocked. I just wasn’t swept away the same way I was with Dark-Hunters. I find it hard to empathize with the characters no matter how sad their sob stories are. The back stories just didn’t jive well with the intended plot and the myth of these Dream-Hunters. The Olympian Gods are just too soft and less cunning. Hades lost some notoriety in my books after this. He seems less threatening considering that he is the lord of the Underworld and Hades just keep on giving away souls because he sympathizes with these sleep gods. I mean if one is to base one’s fictional myth on a distinguished one, at least try to keep the integrity of it. What makes these Olympian Gods so captivating is they are so petty, selfish and unforgiving and to say that they have God complex is an understatement. Hades just got emasculated here and I’ve always been a fan of this particular Greek God. On the other hand I still praise Kenyon’s storytelling skills albeit her Muse abandoned her during the time she was writing this series. It’s fast-paced and the dialogue is quirky like the rest of her novels. Her characters for this book and Dream-Hunters are intriguing as individuals but when the leads come together to save each other and find true love in one another, they just failed to ignite the same chemistry as the couples in Dark-Hunters. However I will not be following this series anymore and will just stick to her Dark-Hunters. So I say Adios! to Kenyon’s dream world. These rules are implemented by two agencies. First is the Commerce Department, headed by Secretary Wilbur Ross. Trade laws, Commerce has a role as both an investigator and judge. Officers from the neighbourhood, they know him. He has no issue with violence. Everybody just knows he just mentally challenged. M. Mbock a choisi le Qu en magasinant les universit sur internet pour faire une ma en g m thanksgiving shirts Les comp d'une enseignante l'Universit du Qu en Abitibi T ont attir son attention. Pendant funny maternity shirts ses en Abitibi, il a travaill sur une pompe pour d les mines mises au point par l'entreprise rouynorandienne Technosub.